Letter from W. H. Andrews in Johannesburg, South Africa, to The Governor of Alabama in Alabama, U.S.A. 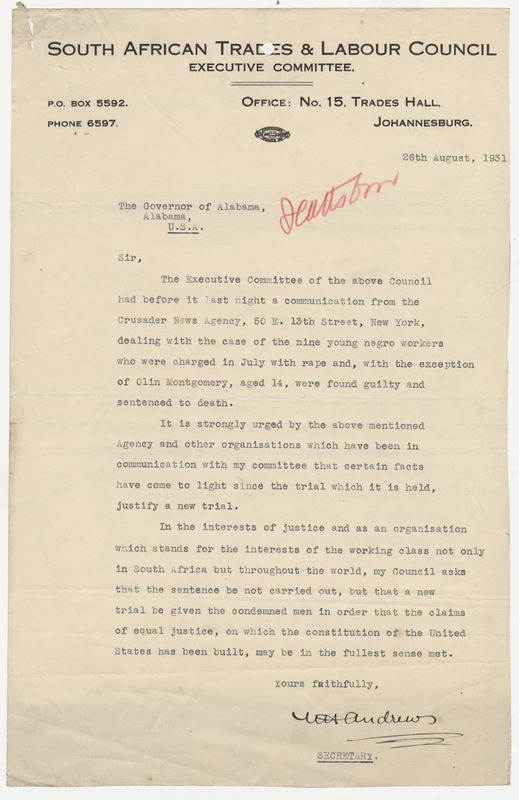 This international letter asks that the Scottsboro Boys be given a new trial, based on new facts which have come to light. Standing for "the interests of the working class not only in South Africa but throughout the world," the letter urges the governor to enforce the laws of the United States Constitution with equal justice. The letter was typed by W. H. Andrews, secretary of this committee, chairman of the South African Labour Party, and general secretary of the Communist Party of South Africa. P.O. BOX 5592 OFFICE No. 15. TRADES HALL. States has been built, may be in the fullest sense met. 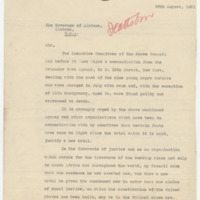 South African Trades & Labour Council, Executive Committee (Johannesburg, South Africa), “Letter from W. H. Andrews in Johannesburg, South Africa, to The Governor of Alabama in Alabama, U.S.A.,” Scottsboro Boys Trials, accessed April 23, 2019, http://scottsboroboysletters.as.ua.edu/items/show/491.